So before I show you the nursery, I have to show you where I started! Below is a picture of our guest room on the main floor of our house. This room was rarely used, other than for storage and looking pretty! Since its right next to our bedroom, its perfect for the nursery! 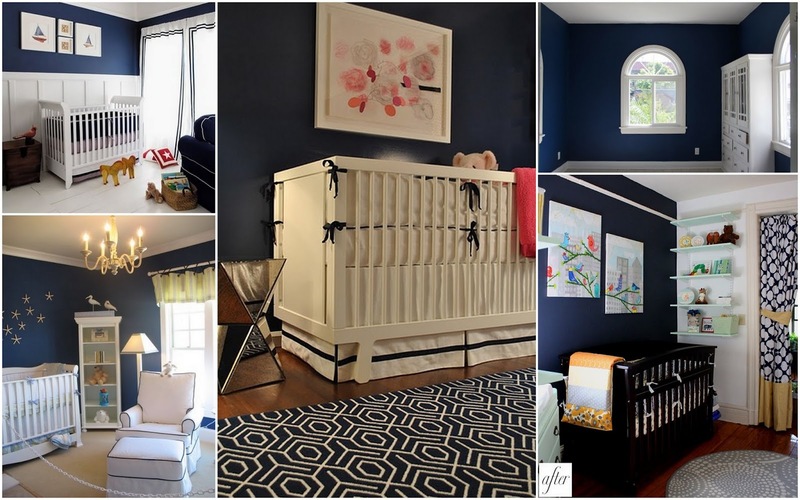 Before we knew if Baby Roberts was a boy or a girl, I fell in love with the idea of painting the nursery a dark blue. I figured I could use accent colors based on the gender once we found out! Below are a couple of pictures I tagged on pinterest for ideas. And here are the after pictures! I am so pleased with how everything has turned out. Of course things are still a work in progress as we continue to get items needed, but if Baby Boy Roberts comes sooner than later, at least we are ready! Hanging above the crib are three Ikea frames. In the frames are the crib skirt fabric and some adorable green giraffe fabric! The white bookshelf was one I already had since college, but is a cute addition to the room to display items! My mom had the blue and white curtains on hand that I could use, but we added a stripe of green fabric to tie in the colors of the nursery. The crib skirt fabric is from Forsyth Fabrics, the crib sheet is from Tuesday Morning, and the bumper pad is Carter's that was originally all white, but we added the pops of blue and green for the cording and ties. The changing table is a dresser from Ikea. The lamp on the changing table was found at TJ Maxx, but the fabric was swapped out with the crib skirt fabric. The mirror is from HomeGoods. We replaced the knobs on the dresser with knobs found at Hobby Lobby. I love how it ties the room together! The glider and ottoman are Little Castle from Buy Buy Baby. The floor lamp is from IKEA, and the framed print was a gift from a friend, which was my inspiration for the colors of the room. This past weekend, my sweet friends on St. Simons threw me a baby shower! It was such a beautiful day, and I was thankful to get out of the house! The decor was blue, green and white - the same colors as our nursery! And my sweet cousin, Mayer, made the trip down from Atlanta! And baby Roberts received a lot of great gifts! All of the wonderful hostesses! Next post ... nursery reveal! Wow, I can't believe how long it has been since the last time I did a blog post! Time goes by so fast, and I have no excuses! So a few days ago I received the latest Cooking Light magazine in the mail, and it had the recipe for this Tomato, Squash and Red Pepper Gratin, and I had to try it! Johnathan and I had a cookout over at our friends house last night, so I brought this along as a side dish. I wish I had an after picture of the casserole dish, because it was cleaned out! Everyone thoroughly enjoyed the dish, so I thought I'd share the recipe! 2. Heat a large nonstick skillet over medium heat. Add 4 teaspoons oil; swirl to coat. Add onion; cook 3 minutes. Add bell pepper; cook 2 minutes. Add squash and garlic; cook 4 minutes. Place vegetable mixture in a large bowl. Stir in quinoa, 1/4 cup basil, thyme, 1/2 teaspoon salt, and black pepper. 3. Combine remaining 1/4 teaspoon salt, milk, cheese, and eggs in a medium bowl, stirring with a whisk. Add milk mixture to vegetable mixture, stirring until just combined. 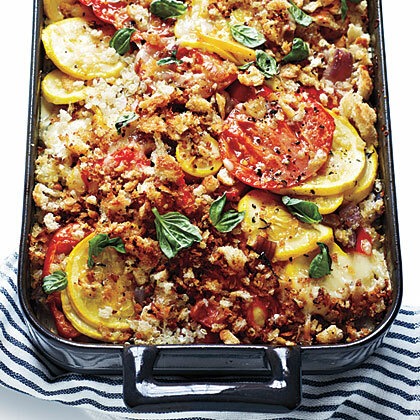 Spoon mixture into an 11 x 7inch glass or ceramic baking dish coated with cooking spray. 4. Place bread in a food processor; pulse until coarse crumbs form. Return skillet to medium-high heat. Add remaining 1 teaspoon oil to pan; swirl to coat. Add breadcrumbs; cook 3 minutes or until toasted. Arrange tomatoes evenly over vegetable mixture. Top evenly with breadcrumbs. Bake at 375° for 40 minutes or until topping is browned. Sprinkle with remaining 1/4 cup basil. **note: Instead of making my own breadcrumbs, I used store-bought croutons. I crushed them and placed them on top of the casserole before baking. Definitely a time saver! This past week I was on Spring Break (working at a school definitely has its perks!) so Johnathan and I decided at the last minute to plan an impromptu trip to Fort Lauderdale! We had heard friends say they really liked that area, so we thought it would be fun to check it out! We left Thursday afternoon and arrived around dinner time. Thankfully we found a great pizza place and enjoyed a low key meal! Saturday morning when we got up, it was pouring down rain outside! I was seriously depressed thinking we weren't going to be outside much, so we went into town. At a traffic light we see this Ferrari next to us with a young guy driving - we both thought "who is this kid driving a Ferrari?" Well, we looked a little bit closer and it was Matt Stafford! I really wanted to roll down the window and yell "Go Dawgs!" but Johnathan was embarrassed, so I snapped this picture instead! Thankfully the rain and the clouds cleared out quickly, so we headed straight for the beach! Right now I am reading the Hunger Games series, and I am obsessed! I have literally read the first two books within about 4 days, and now I am on the last book. I can't wait to see how it ends! View from our hotel room Friday evening overlooking the inner coastal waterway. All day Saturday was spent at the beach again, then we decided to get ready for dinner early and go to a local bar to grab a drink. We were sitting next to the water when this random guy flew up to us! He's wearing some jet pack that propels him with water. It was entertaining! Quick picture before heading to dinner! Dinner on Saturday was at a local dive called Rocco's Tacos. It was a fun Mexican restaurant that had great food and margaritas! On Sunday morning we decided to drive up A1A along the coast line to see a few towns north of Fort Lauderdale (Boca Raton, West Palm Beach). It was an absolute gorgeous day and I did not want to leave, but we had a lot of fun! I am a newlywed living on a small island off the coast of Georgia. I love island life and enjoy DIY projects!! Keep up with our daily events and happenings here! You can also follow my other DIY blog ~ theturquoisenest.blogspot.com!